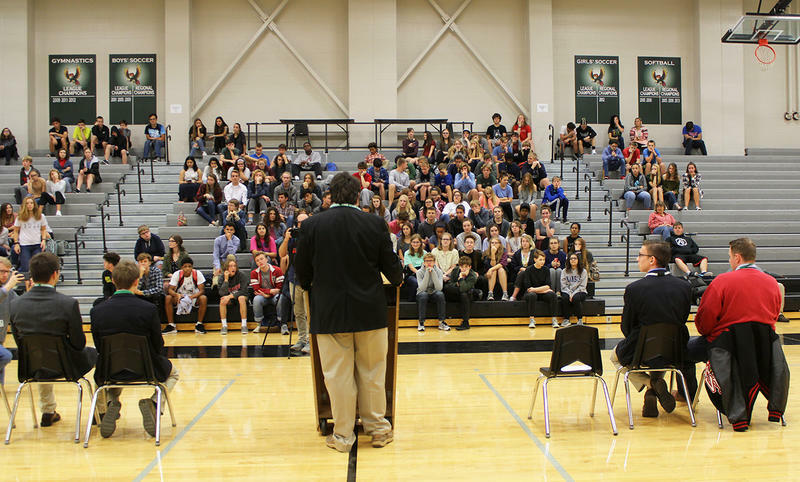 The four teenagers running for Kansas governor faced questions from students at Lawrence Free State High School during a Thursday forum. 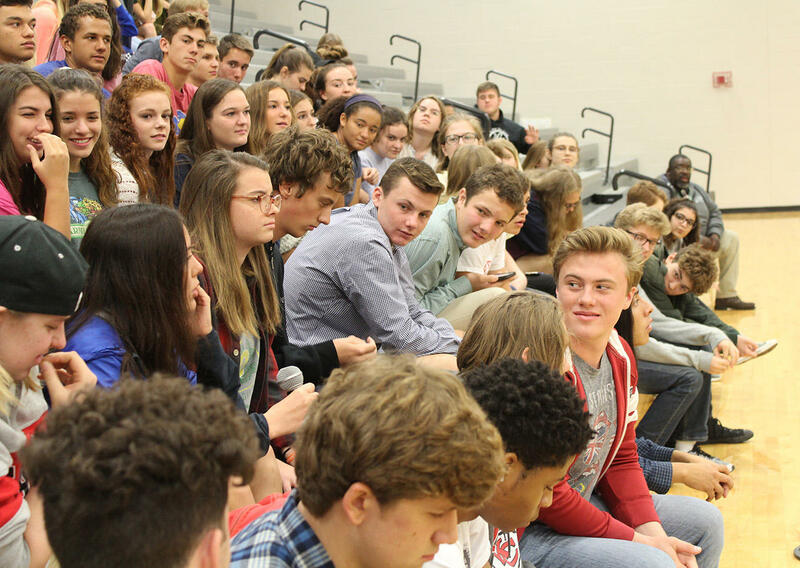 The four teenagers running to be the next governor of Kansas were tested Thursday at a forum organized by their peers at Lawrence Free State High School. Standing at the center of the Free State gym, they fielded questions on gun control, race, drugs, abortion and a host of other divisive issues. They answered forthrightly. Honestly. Not by pivoting to talking points like more practiced politicians. 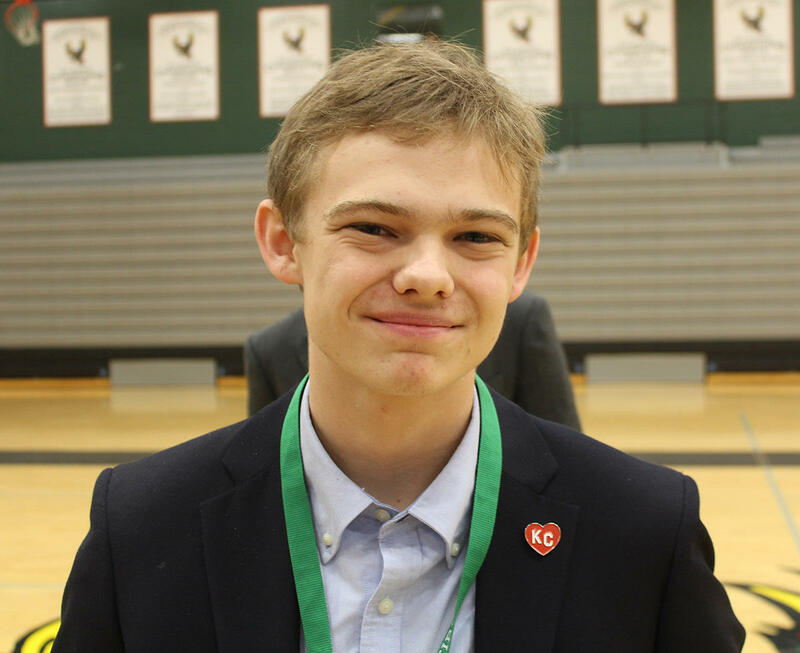 Tyler Ruzich is a 17-year-old Shawnee Mission North student from Prairie Village running for Kansas governor as a Republican. 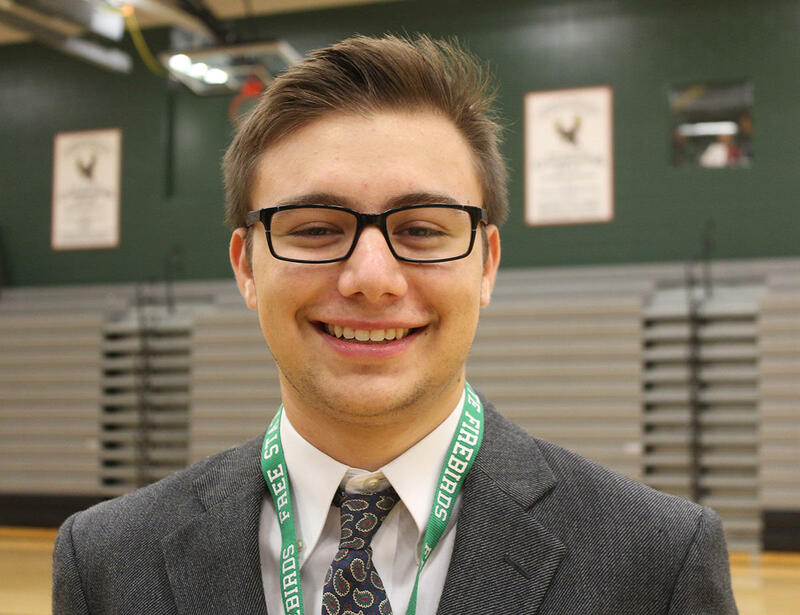 “There’s the art of not answering questions, but what good does that do for voters and our democracy?” asked Tyler Ruzich, a 17-year-old Shawnee Mission North student from Prairie Village who is determined to be on the Republican primary ballot. Candidates have a “moral and ethical” responsibility to share their true beliefs so that voters can make informed choices, Ruzich said. The Free State students certainly did. They pushed the high-school hopefuls for their positions on issues that many politicians are reluctant to discuss. In addition to Ruzich, Jack Bergeson and his lieutenant governor running mate, Alexander Cline, both students at The Independent School in Wichita, participated in the forum along with Ethan Randleas, a student at Wichita Heights High School, and Dominic Scavuzzo, who lives in Leawood but attends Rockhurst High School in Kansas City, Mo. 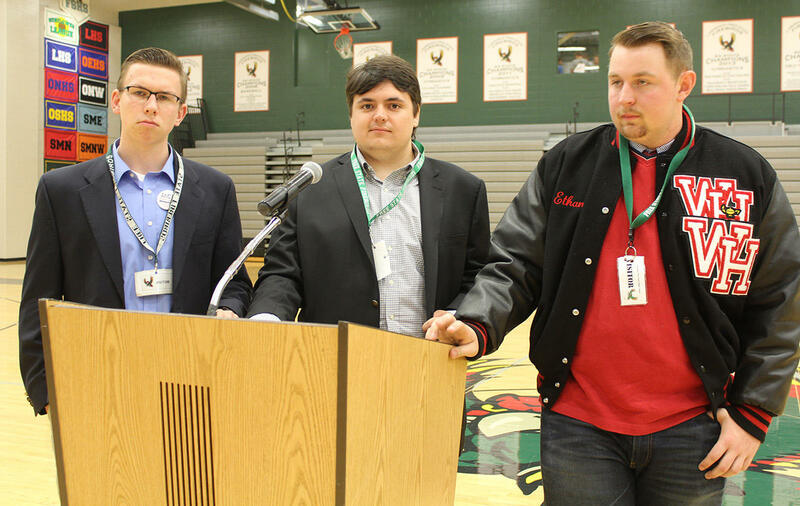 Other teenage candidates include Democrat Jack Bergeson, center, and his lieutenant governor running mate, Alexander Cline, left, both students at The Independent School in Wichita. At right is Libertarian Ethan Randleas, a student at Wichita Heights High School. A question about gun control touched off a lengthy debate. Bergeson, the first of the four teen candidates to announce, said he differed with most other Democrats on the issue. That’s what Free State senior Paul Jesse wanted to hear. He’s strongly opposed to recent changes in state law that allow students, faculty and visitors to carry concealed handguns on university campuses. As he did throughout the forum, Randleas held fast to his Libertarian views. “There’s a lot of trigger words here like guns off of campuses,” he said, arguing that it’s “asinine” to suggest that someone’s Second Amendment rights are suspended when they step onto a college campus. The role of government also proved to be a point of contention, with Randleas arguing for smaller government and the elimination of individual income and corporate taxes and the others calling for increased investment in education, health care and infrastructure. Republican candidate Dominic Scavuzzo lives in Leawood and attends Rockhurst High School in Kansas City, Mo. “I support publicly financed elections but believe that system will only work if there is a national framework behind it,” he said, pledging to set an example by accepting only individual donations of $500 or less for his campaign. There was relative harmony on some issues, including LGBT rights. “I think this is something we all agree on, and that’s pretty cool,” Randleas said. Scavuzzo, a Catholic, said his religious beliefs make it difficult to support laws that prohibit discrimination based on sexual orientation, but he said he is personally opposed to it. “People just need to be more accepting,” Scavuzzo said, adding that he would “try to appoint” members of the LGBT community to his Cabinet if elected. Likewise, the candidates were in lockstep on the need to legalize, or at least decriminalize, marijuana. Several promised if elected to release inmates serving time in state prisons for non-violent drug offenses. Bergeson said he would push to add Kansas to a growing list of states that have legalized medical marijuana. “In my opinion, it is despicable that the law in this state forces people with certain illnesses to choose between abiding by the law … or living a healthy life,” he said. Ella Keathley, the Free State student who organized the forum, said the event exceeded her expectations, particularly the level of student involvement. The level of student involvement at Thursday's forum pleased organizer Ella Keathley, a student at the school. The teacher who helped Keathley pull the event together also was pleased. “I thought it came off great,” said Blake Swenson, who teaches government, history and social studies at Free State. “I was impressed. When the questions came, there was no fear,” he said. Kansas is one of a handful of states that doesn’t require candidates for governor to be of a certain age. 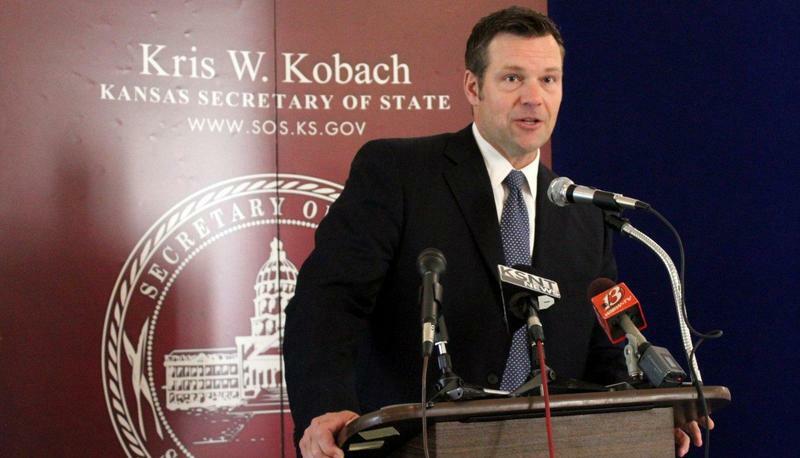 Kansas Secretary of State Kris Kobach wants to change that. 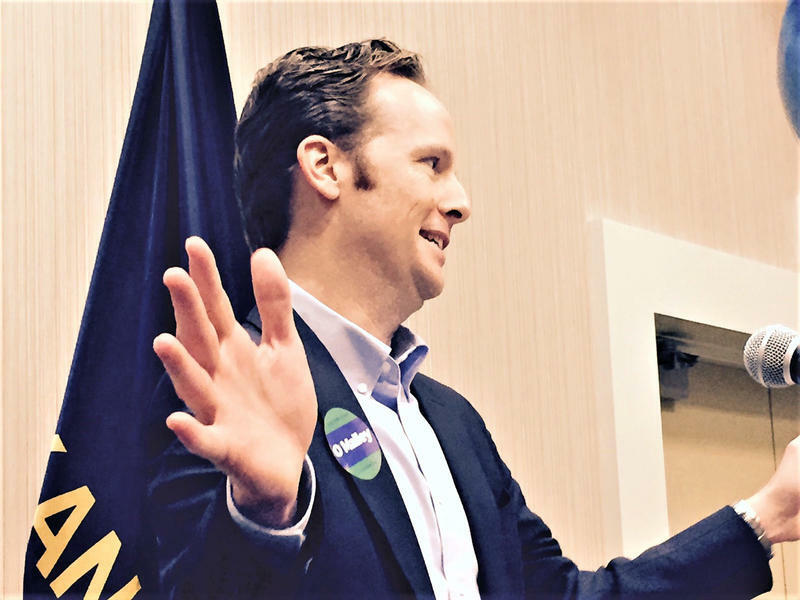 “I think it’s both amusing and encouraging that high school students are throwing their name into the governor’s race, but it is appropriate to have minimum ages for the governor’s office,” Kobach told the Kansas City Star in September. But Keathley said there is no reason that Kobach, who is running for the Republican nomination for governor, or anyone else should be threatened by the wave of teen candidates. An effort to impose an age requirement now that Kansas teens have engaged in the political process would “just show that they’re cowards,” she said. Jim McLean is managing director of the Kansas News Service, a collaboration of KCUR, Kansas Public Radio, KMUW and High Plains Public Radio covering health, education and politics. You can reach him on Twitter @jmcleanks. Kansas News Service stories and photos may be republished at no cost with proper attribution and a link back to kcur.org. Republican O’Malley Enters Crowded Kansas Governor’s Race; Independent Orman Next? Kansas gubernatorial candidate Ed O’Malley came out swinging Tuesday at a campaign launch event in Overland Park. A year from now, Kansans could be in the middle of the biggest primary battle for governor in recent history. With Lt. Gov. 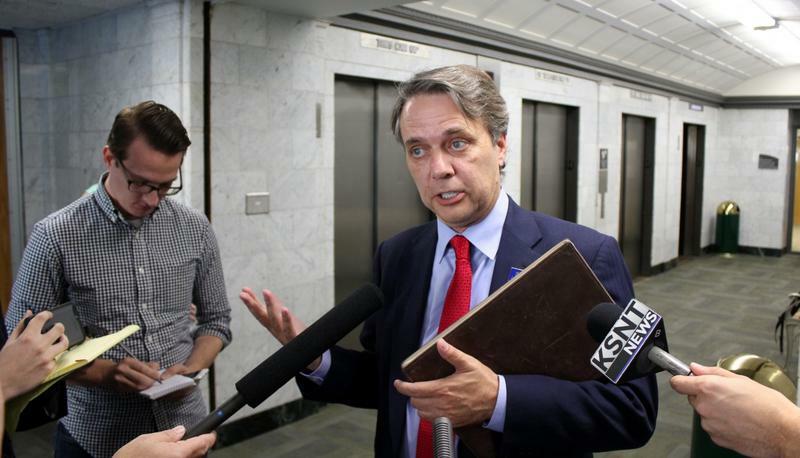 Jeff Colyer poised to finish the second term of Gov. Sam Brownback — likely to leave office soon for an ambassador job — candidates are lining up for the 2018 contest. Lt. Gov. Jeff Colyer announced Tuesday that he will run for Kansas governor in 2018, ending speculation that he would enter the race. 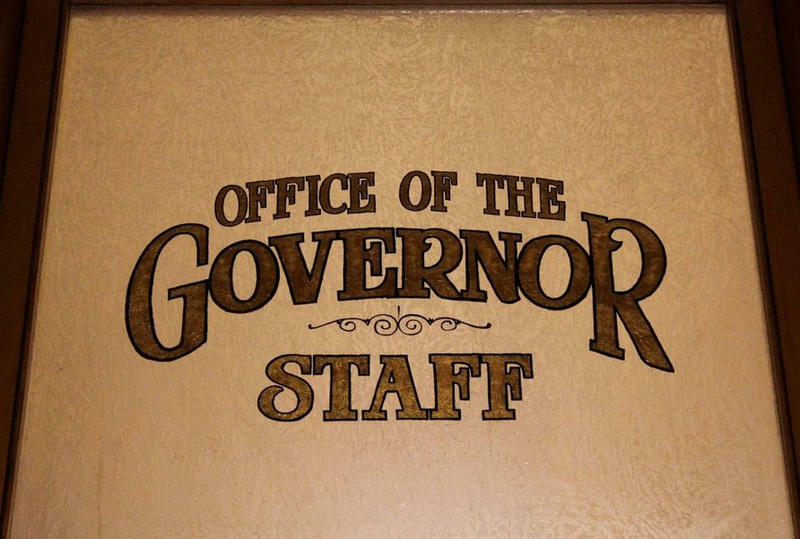 Colyer is set to take over the executive office because current Gov. Sam Brownback is expected to step down later this year for a diplomatic position in the Trump administration. Speaking before the announcement, Colyer said he’ll bring more collaboration and a change in tone to the governor’s office. The filing deadline isn’t until next June. But candidates already are lining up for what could be the toughest job in Kansas: succeeding Gov. Sam Brownback. Four hopefuls are at least tentatively in the race and several more are thinking about getting in, including some Republican heavyweights.